"Tio is the littermate to CH Belgairn Polo JH and Belgairn Sneak-A-Peek. 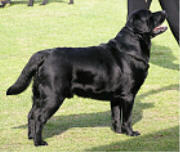 He was bred by Belgairn and obtained his championship with Helayne Zoota of Layney Labs. He is owned by Janet Schoonover and Terry McFadden of Char-Don & Ms T Labradors. With Janet and Terry he has earned all his working titles and mutiple specialty wins. Listed below are his clearances and his pedigree, along with links to his get. Go to his page on the Char-Don / Ms T site to see more pictures of Tio, and information about his show and field career. "